Each year the Vero Beach Art Club awards 4 scholarships in the amount of $3500.00 each totaling $14,000 (increased from $3000 each in our 2017 season). See our Scholarship page for previous winners and details about how to apply. The Vero Beach Art Club donated $1,000 to the Vero Beach Museum of Art's summer camp program to help financially disadvantaged students attend art classes. We also sponsored t-shirts with a $100 donation. Each year the Vero Beach Art Club donates to the Vero Beach Museum of Art Summer Camp Scholarships. We love supporting this wonderful event that allows students from around the Indian River County to experience and learn about art. These are our future artists and our support furthers our mission of encouraging children to become involved in our community through art. The Art Club donated $100 each to art teachers at 17 public elementary and middle schools in Indian River County for a total of $1,700.00 for our 2017-2018 season. Each school receives art supply credit to go directly to the art teacher for craft supplies and art projects to foster art education for the students. The Vero Beach Art Club also offers reasonably priced memberships for our Junior Members ages 12 - 17 at $5.00 per year. We encourage students to become members and participate in our exhibits, shows and sales. Art teachers may also sponsor a student if they wish. We also now offer a FREE membership to students from ZERO - 11 years of age. Click on the Membership button below for details. Vero Beach Art Club members are sponsored by Springhill Suites Marriott for this annual event to raise funds for middle school student's art supplies. Each year we choose a different middle school to benefit from our proceeds. Our members create "miniature" art in 2D and 3D to sell for this wonderful cause. Middle school students also exhibit their artwork, which is judged with awards presented. What a wonderful way to encourage students to become involved in our art community. The Vero Beach Art Club has Junior Memberships available for students age 12-17. Each year we participate in the Festival of Trees by decorating one of the trees that will be auctioned off to benefit the Riverside Children's Theatre. The theme for this year's Festival of Tree's is Louis Armstrong's "What a Wonderful World". 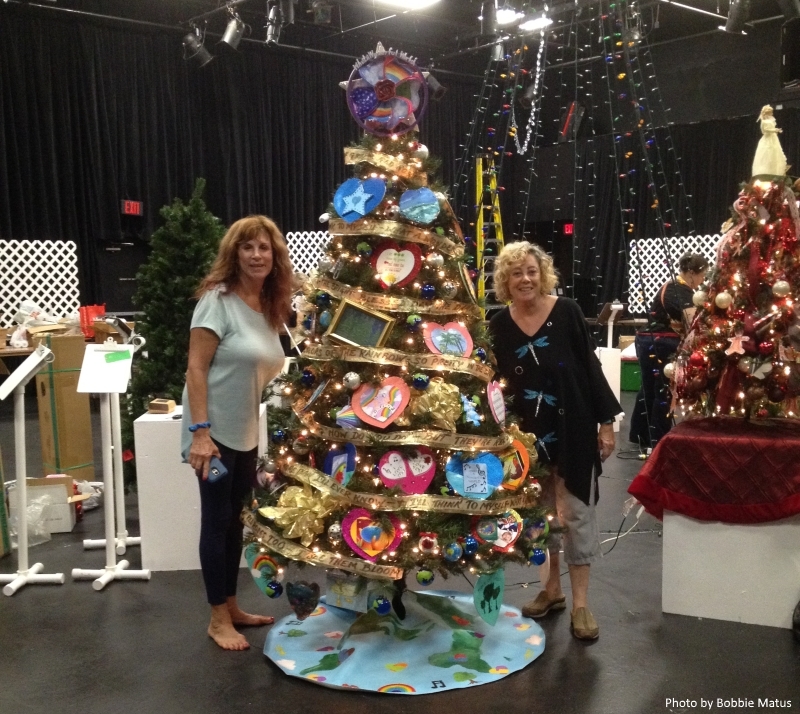 Our members create beautiful themed ornaments and then we decorate our Vero Beach Art Club Christmas tree. The trees are auctioned off to benefit the Riverside Children's Theatre. The theatre produces many wonderful productions each year that showcase the talent of the children in our community. Click on the button below for details for submitting an ornament that will reflect our theme this year. 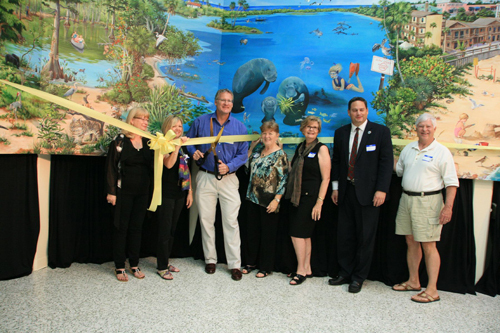 Left to Right: Artist Dawn Mill, Artist Judy Burgarella, Recreation Department Director Rob Slezak, Artist Christine Thomas, Vero Beach Art Club President Mary Ellen Koser, Vice Mayor Jay Kramer, and City Manager James O'Connor. Hibiscus Mural at the intersection of SR60 and Commerce Ave. The Art Club is responsible for beautifying the downtown wall for the City of Vero Beach located on the eastbound side of State Road 60 between Commerce Ave. and the RR Tracks (between the American Icon Brewery in the old diesel plant and the Blue Octopus Shop). Thank you to Karen Leffel Massingill for her design and all the artists and chair, Sue Dinenno for its implementation. A new beautification project to add a mural to another City of Vero Beach property at the Bethel Creek House was completed in 2015. Designer and Project Manager Lee G. Smith created a beautiful “realistic impressionism” mural of Jaycee Beach. Click on the link below to see more pictures and details about the project and volunteer artists. Under the direction of Carol Makris, members painted a mural showing many of the local birds found here in Vero Beach. The mural is on the north side of the Racquetball building in Riverside Park and was dedicated in 2016. Click on the link below for more information and pictures. 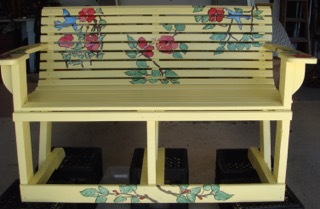 The good ladies of Rita Sprague's Open Studio banded together to paint a bench built and donated by James Drinkard. The bench was auctioned off during a "Cherish the Children" auction to help the Hibiscus Children's Center. The Vero Beach Art Club provides artwork for "Art in Public Places" at the Indian River County Main Library. Each piece is from a member of the Vero Beach Art Club and the exhibit is changed on a quarterly basis. Art Club members may exhibit their art and supply contact information for those interested in purchasing their work. Each year the Vero Beach Art Club donates a check to the Recreation Department of Vero Beach for art supplies. This helps them provide Summer Camp Scholarships and art supplies for their summer programs and throughout the year. This year we gave $2,000, plus art supplies.